Plan the urban vacation of a lifetime with this free guide, 200 Things to See in America's Biggest Cities. Where are you headed for your next family vacation? Why not one of America’s cities? In the hustle and bustle of America’s biggest cities, you can find amazing and unique things to see and do. Whether you’re a native looking for something new to do, or a tourist who wants to do it all, there’s something for everyone to enjoy. In this Your AAA guide to the 200 things to see in America’s biggest cities, you can learn all about the most populous areas in the country. The great thing about big cities is that there’s always a huge variety of landmarks, sights, museums and curiosities. From New York’s Times Square to San Jose’s Tech Museum of Innovation, there are great things to see and places to go in each one of these iconic cities. You can download “200 Things to See in America’s Biggest Cities” right now and start planning your next adventure. Get your free guide today. See everything these cities have to offer. Decide on the best city to visit. Plan a city trip like a professional. Relax in urban hideaways that other tourists don’t know about. Discover the secrets of America’s most populous cities. Learn about the best places to get a Philly cheesesteak in Philadelphia. Find incredible sites to visit, like living history museums and thrilling observation decks. See amazing snapshots from each of the biggest cities in America. Read about local city secrets that will make your vacation extra special. Remember, you can download this guide immediately, read it at your leisure and open it whenever you start to plan your big city trip. What are you waiting for? Download a copy of this awesome guide today! America’s most populous cities are fast, fun and exciting. When you’re traveling in one, you don’t want to miss a thing. 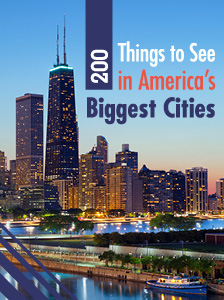 With our guide, “200 Things to See in America’s Biggest Cities,” you don’t have to. You can download these and other great guides right now. We hope they inspire your next epic urban vacation. P.S. : When you’re ready to book, the expert AAA Travel counselors can help you plan every facet of your vacation, from your hotels to your rental car and theme park tickets. Call 800-847-8091 to talk to a AAA expert today or click here to see all the trips and discounts available to AAA members.